Stories of older preemies, from the Preemie Child support group. Our son Alex, was born 1 pound 2 ounces in 1986, at 26 weeks gestation age. In addition to being premature, Alex had UGR (uterine growth retardation). He is now an adult. For weeks following his birth, we were told to prepare for his funeral. Alex had NEC in his first week of life. He was too fragile for an operation and we were told his recovery was miraculous. Alex received IV's for most of the time, till moving to tube feeding. He was put on the respirator right away and stayed there for 90 days. We weren't allowed to hold him for two months, except for the times when we all thought he was dying. More than once, he was given more than 100% life support as we sat by his side. 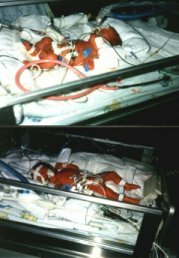 When he came home at 4 months of age, he remained on oxygen until he was a year old. Just before his first birthday, we discovered that he had a diaphragmatic hernia (his intestines had broken through his diaphragm into his chest). He received an emergency operation and rolled over for the first time soon after. There are many more stories to tell about Alex's first years. We experienced just about every problem you can in the NICU and thereafter. If you saw Alex today, you would have a hard time believing he had such a precarious beginning. He has a wonderful sense of humor, a love of reading, and can be quite caring. However, despite outward appearances Alex was severely impacted by this experience and we realize now that he is likely to be unable to live independently. Alex is an "alphabet kid" - ADHD, Learning Disabilities, mild Cerebral Palsy, processing problems, social skills delays, developmental delays, BPD followed by chronic asthma and then allergies, ongoing gastrointestinal reflux, intestinal problems, and ROP/vision impairment. At ten he was diagnosed as having high functioning autism. In sum, his impacts span the gamut of prematurity effects. Despite his struggles, Alex is a great joy to our family and we are so very grateful to have him with us. 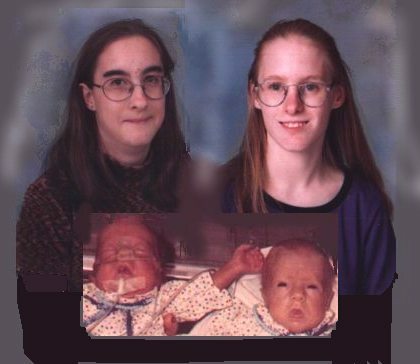 Justice and Destiny were born on 1-19-93 at 25 weeks gestation due to PROM. Destiny had a typical little girl feeder and grower experience although she did have a Grade I IVH and some circulatory problems that resulted in the loss of the tips of two fingers. At age 5 now she was a sharp little cookie but EXTREMELY hyperactive. She did well in preschool which is Montessori-style so she can float from one activity to another and stay busy and learning all day. I am very worried about kindergarten which she will be attending this coming fall. She already knows all the kindergarten stuff and if she gets bored or is expected to sit in a chair for long periods of time, trouble will follow. Justice had one of the more complicated sorts of NICU stays. While he managed to emerge physically intact, he is diagnosed with PDD which is an autistic spectrum disorder. He is also very hyper and distractible. At age five he had approximately 50 words that he uses communicatively. He has been in public schools since 33 months of age and believe me, that has been a real learning experience - for me. 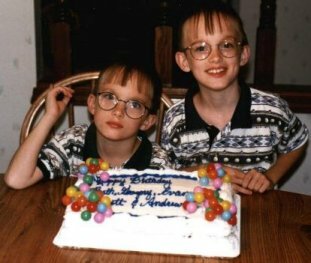 My husband, Mike, and I are parents to preemie twin boys, Gregory and Evan, who are now 9 years old and in the third grade. 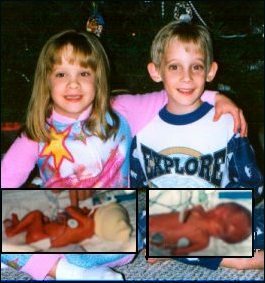 They were born at 28 weeks weighing 2 pounds 12 ounces and 3 pounds 1 ounce. Gregory, the larger of the twins, was in the hospital 8 weeks and had few problems. Evan, on the other hand, had one complication after another - they told us he would never live. When he was nine weeks old, they told us it looked like he would live, but had an 80% chance of having cerebral palsy. Or, if it wasn't CP, he would be seriously developmentally delayed - they couldn't promise us he would ever be toilet trained, feed himself, speak in sentences, or walk. He came home after 3-1/2 months, but was back in the hospital three times by the time he was 18 months old. Both boys recieved OT/PT/Speech for about 3 years, and Evan still struggles a little with handwriting and some fine motor things. In kindergarten, the public school here wanted to put the boys in a multiple handicapped classroom, which we fought. It was a nightmare! We moved them to a small private Christian school where they have made remarkable progress. They are both on the honor roll and happy in the nuturing environment there. In elementary school, our biggest concern was Gregory and Evan's physical size. At 9-1/2 years old they had the bone age of a 6 year old. It is frustrating because the size issue is becoming a bigger and bigger problem to the boys. I am from Cape Town, South Africa. I have two premature children. Gareth was born in November 1991 at 33 weeks, he was quite healthy at birth and we thought that we were home free with him but he has quite chronic asthma. We keep him on a maintenance dose of Flexitide and still he needs to be hospitalized at least 3 times a year, he has just started what we call "big school" and is doing very well. Devin was born in March 1994 at 26 weeks and was critical for 3 months. He was in and out of hospital up until about 2 years of age and so far does not seem to have asthma. He does however seem to be ADD, I do not want to label him too early but he is very active. We did find him to be very LOUD and his speech was not very distinct but since having another set of grommets installed he has improved dramatically. I know that I am very fortunate in that both my boys are relatively unscathed from their early beginnings but I know that we have a long way to go and are prepared for development problems that may arise in the future. If I look back now at the "early days" I cannot believe the progress that has been made by my boys. I am also so thankful for support groups like Preemie-l and Preemie Child. When I went into labour at 24 weeks I had absolutely no concept that a child could survive being born so early and had no idea of what the road ahead would be like. My son Tyler was due on February 2, 1995. He was born on November 13, 1994. I was 28 weeks pregnant and he weighed 2 lb. 5 oz and then went down to 1 lb 11 oz. I am the mother of almost 14 year girls that were born 13 weeks premature. The girls had a brother that only lived 15 days. They spent 110 days in the hospital and came home together. In middle school they both made the Honor roll. Alicia has mild cerebral palsy which affects her physical capabilites at times. Jessica has worn glasses since one year of age and has had eye muscle surgery three times - the most recent only two weeks ago. The surgery went well and appears to be a success and she had very little pain with the procedure. I have 6 year old twins who were born at 24 weeks. Ryan and Elizabeth were somewhat delayed but have done a great job of "catching up". They began kindergarten in the fall of 1998. Elizabeth has some fine motor delays and wears glasses due to retinopathy of prematurity. Her height and weight are within typical ranges for children her age. She did have surgery for bilateral esotropia at age 1. She is otherwise healthy, quite shy and very aware of her "early start" in life! She is doing well in school despite the fine motor delays and pretty much just loves life! Ryan is still quite small for his age and that has become an issue as he has entered school where "almost everyone is bigger than me". What he lacks in brawn he makes up for in brains! He is a very bright child and is quite intuitive. He has had 2 inquinal hernia surgeries, one at a year old and the most recent when he was 5. We had always believed he had BPD (or Chronic Lung Disease) but recently our pediatrician questioned that diagnosis and we now believe he didn't have BPD but rather aspiration pneumonia that was the cause of the damage to his lungs. He has no indicaiton of BPD either on x-ray or symptomatically currently. Any preemie parent you meet will tell you we are a special breed of people - parents of preemies and their preemies - and we are! We know how precious life is and we cherish every minute we have with our "little miracles"! Tyler is hyperlexic and is diagnosed in the autistic spectrum. He went to school full time in an autistic preschool. He was able to read at 2, knew his ABC's at 18 months and could count to 100 before he was 2. He is extremely affectionate and is talking and communicating a lot better since school. He used to only communicate his needs (juice, video, CD-ROMs, etc.). Now he will communicate other things as well ("I'm sad", "good morning" and "gimme kiss" to name a few) and he is becoming a lot more social. My husband and I have high hopes for Tyler. I see little improvements in him all the time. I also have a younger daughter named Summer. She is the best thing for Tyler. Forces him to interact and fight back too!